In one of my earlier posts from 2010, I spoke about the French Domyos pointe shoe model Renaissance. After visiting the website, I noticed that the Renaissance model is sadly no more. However, there is another interesting shoe in its place; the Relevé. According to Domyos, this model was created to alleviate pain on pointe. The inner toe is lined with an award-winning elastomer insert material for shock absorption and comfort. You can also see the traction tip on the platforms. The wide metatarsal area reminds me of the Capezio Aerial. It isn’t going to work for every foot shape, but pointe shoes constructed with extra width in this area are a blessing for dancers that need the room. With all the other athletic products and shoes that this gargantuan company manufactures, it’s wonderful to see a highly promoted specialized pointe model in their collection. Another feature of this model is a 2-year guarantee. (!) Only time will tell if that is true. This model has only been on the market since Spring. If there is no paste to break down, a reinforced tip and strong polyester fabric used, it may outlast a traditional pointe shoe. You can read details about the Relevé in English here. As I was writing this, I couldn’t help but remember the demise of a similar silicone-pad-built-in idea; the Capulet Juliet D30. After the novelty wore off and the negative reviews started spreading online, both the shoe and eventually the Capulet brand bit the dust. With frequent use, pads shred, break into pieces or move round inside the toe box. Odor. With the heat and sweat that builds up during class, pads that you can’t take out and replace with fresh ones turn pointe shoes into stink bombs. Feeling bulky, can’t feel the floor as well, no room to add additional toe protection. On a positive note, I wish Domyos the very best success with the Relevé. 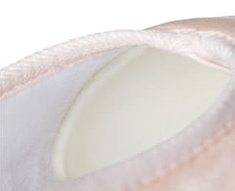 I would love to hear your opinion about pointe shoes with built-in padding. The Domyos official website offers a choice of many languages, but you can choose the UK link for English. You can find many more photos of their products on their Facebook page. This entry was posted in French Brands, New Models 2015 and tagged French pointe shoes, high tech pointe shoes, pointe shoe brands made in France, pointe shoes wide metatarsals, Relevé by Domyos, Relevé pointe shoes. Bookmark the permalink.